Scott-Rigid™ engraving sheets and custom-cut pieces do great work in tough places. They don’t melt like thermoplastic engraving materials – an important attribute for fire safety in public buildings – and offer superior arc resistance. This rugged 3-ply material is available in thicknesses of 1/8” and 1/16”. Buy in full 18”x 38” full sheets or 18”x 19” half-sheets. 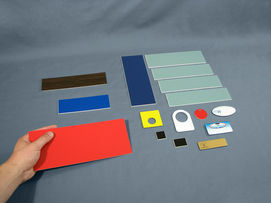 We can also saw to your specs as sign blanks or profile cut for pushbutton labels, equipment panel I.D.’s and more. The material may be rigid, but we’re very flexible! Have a hot application? This rigid phenolic engraving material withstands high heat environments, which makes it ideal for electrical control panels and areas where temperature is an issue. Use rigid engraving plastic for pipe markers, valve tags and instrument panels in boiler rooms, engine rooms and on heavy equipment exposed to scuffing and abrasives. Our 3-ply, 1/16” thick, 18”x 38” sheet is just $51.80. As little as 1 or as many as you need, we can fill your order. Click the image for a close-up view of the engraved material. If you want your sign blanks ready to engrave, we’ll pre-cut them as rectangles or in any custom profile for push-button labels, valve tags or even as professional-looking name tags. We cut our blanks at a slightly beveled angle, to provide an attractive core color line along the edge. Please refer to our diversified color chart to see all your choices. 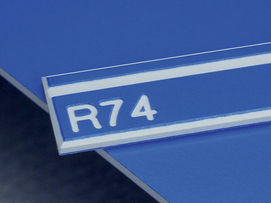 Keep in mind that this rotary engraving material – also known as Norplex or phenolic engraving plastic – is excellent as a substrate for vinyl letters. With so many different uses, here’s your chance to be creative! We have lots of helpful suggestions for you; just click "How We Help" at the top of this screen.